Most states will raise the minimum wage marginally, while others like California and Massachusetts will see larger increases. However, the most substantial changes to the labor price floor are at the local level. The state minimum wage for New York state was raised to $11.10 for 2019; however, New York City took the fight for pay equality to the next level for restaurant workers by raising its minimum wage to $15 for businesses with more than 10 employees. Currently, employees in New York City who earn tips can be paid a lower rate, now set at $10 an hour for waiters, provided their total pay exceeds $15. Tipped workers still receive a minimum of $15 per hour; however, the employer must make up the difference if tips plus the $10 base pay don't reach $15 per hour. A very complicated process, indeed. When restaurant owners were asked what their plan would be to rework payroll changes to accommodate for the minimum wage hikes, the most popular answers were price increases and payroll cuts in the forms of reduced hours and eliminated jobs, according to a survey conducted by the NYC Hospitality Alliance of 486 restaurants in New York City who employ nearly 14,000 tipped workers. Businesses can raise prices to accommodate for the wage floor increase but only to a certain degree, as price increases make their businesses less competitive. 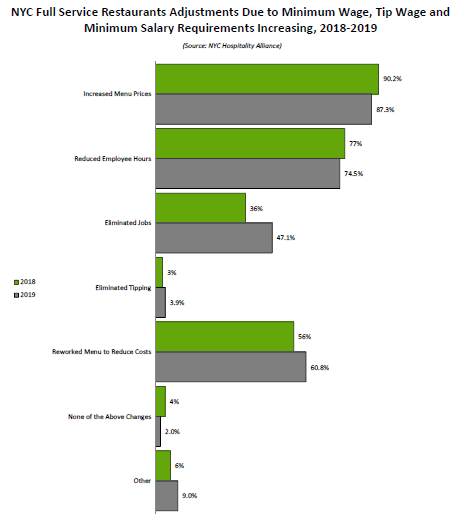 Restauranteurs appear to be doing exactly what they said they would do in the survey and the results to these extensive wage increases are seen in the aggregate data. In 2018, for the first time in more than a decade, the number of restaurant jobs in New York City declined. And early data show the erosion continued in the first two months of 2019 with the losses almost entirely in full-service restaurants, reported Crain's New York Business (March 26). New York City's minimum wage has risen rapidly in the past two years, with a 36% increase in hourly wages. These job losses could be caused by other economic factors; however, when the aggregate full-service restaurant job growth, the nation at large and the strength of the present day economy is taken into account, it is difficult to theorize what other factors could be causing this significant employment drop besides the expeditious rise of the minimum wage. To supporters of the minimum wage, a labor price floor is needed to ensure that the workers are provided with a "living wage," which may remedy problems such as income equality and uplift the most downtrodden in society. Their belief is that increasing the minimum wage forces the employer to give a higher percentage of profits. In actuality, employers rarely respond to a rise in the wage floor by eating the loss, as only 3.9% of restauranteurs responded to the minimum wage hikes by doing nothing. In addition, most restauranteurs who laid off employees due to the minimum wage hikes overwhelmingly reported that payrolls remained about the same after the layoffs. The result is that the minimum wage increases resulted in the changing in the distribution of wages amongst workers but did not increase overall expenditures on labor. Annual salary is comprised of other components than just hourly wage. If the majority of restaurant's payroll remained the same, it suggests that restaurants cut annual salaries in other places to accommodate the rise in required hourly wages. This results in a situation where workers who are deemed more experienced or more productive receive extra income from the minimum wage bump, while less productive workers are more prone their hours getting cut, laid off or denied a job offer in the first place. Some workers are helped in the short term by minimum wage increases but if the moral goal of the minimum wage is to uplift the most downtrodden and reduce inequality between the most and less fortunate, then the New York City minimum wage laws have failed in their goal, at least in the restaurant industry.